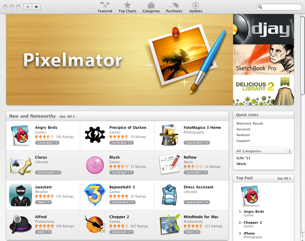 The Mac App Store launched yesterday and saw more than 1m downloads on its first day. Evernote, a note taking productivity app, saw 40,000 downloads because of the Mac App Store. Clearly, a nice first day. Nowadays, it seems everyone is launching an app store. Google Chrome has a Web Store. Amazon.com announced an App Store for Android Apps, that will compete with Google’s Marketplace. And of course, there’s the big daddy of app stores – App Store on iOS for the iPhone and iPad. For the App Store owners the motivation is straightforward – an additional revenue stream. Apple charges 30% to App developers plus a registration fee. For everyone this is an additional way to monetize users and a platform. But what’s in it for users? Quite a bit, I believe. Which is why I think App Stores will succeed for mobile devices, consumer apps and enterprise apps. Inventory – Why is inventory on display important for a retailer? Because customers like to have options. If I’m buying a flat screen TV I want to see different models from different manufacturers, side by side and compare. Also, importantly, inventory on display means that I can, right there and then, buy a TV that I like and take it home. It’s the same thing with Apps. Having thousands of them in one place is of great value to the user. Yes, I could go put Personal Information Manager in Google search and then 20 mins later I might have a list of PIM software. But why go to the trouble? Confidence – When I see a TV at Best Buy, I know that their merchandising team would have done some due diligence on its quality. It gives me some confidence. On an App Store too I expect that Apple or Amazon.com would have tested the product to see that it works and won’t do anything malicious. Transparency – The App Store is Apple’s, not the software company’s. They can’t keep poor reviews or ratings out (although they can load it with positive ones). There is some level of transparency. You can’t hide your warts on an App Store. Bad for the App developer, good for the user. Payment mechanism – Do you want to enter your credit card details at every app developer’s website? I don’t. Apple, Amazon.com and Google checkout all offer an easy, secure payment mechanism. Auto updates – a much easier way to keep Apps updated. Is the 30% cut of revenues too much? It depends on how much you expect your revenues to go up by. After all, software has no marginal costs. Every dollar of incremental revenue is a dollar of incremental profit (before taxes). For small app developers its a no brainer. For established players like Omingraffle, if a significant portion of their revenue stream gets diverted to the Mac App Store, they will need to make up for what they pay Apple in App Store fees in the form of incremental revenues. I suspect that will happen. In any case, they don’t have an option. They have to be available on the Mac App Store. I see App Stores taking hold and becoming a fixture. Which means that making a platform successful (Force.com, Google Docs) suddenly became worth a lot more. That does not equate to 40 000 new users. It quickly became clear to me that to make use of the store’s update tracking I would have to wipe out my Evernote and re-install from the store. So that’s what I did. Didn’t lose a single byte of data in the process, BTW. Another approach is for organizations to set up their own “private” enterprise apps stores. This is appealing to companies who want to leverage their own authentication methods, ensure apps are run by authorized users, and make sure all apps are up to date. This is not necessarily a revenue issue for Apple. The in-house apps are built by the companies, or they may license core technology to deploy productivity apps either with development or license agreements. But this is an important option beyond having a multitude of “consumer” app stores, which serve a different purpose.